Another small update, full details here. Biggest new feature is MOBILE MAP VIEW … with a catch. It only works on Android and iPhone devices. Sorry Blackberry users! As soon as the blackberry browser gets a little better (webkit maybe?) it should be supported too. Mobile Map View is very similar to Desktop Map view with the cache overlay. 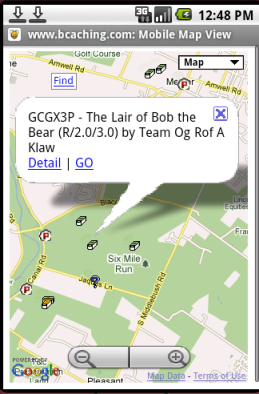 There is a new “Map” link to it on the Mobile Find nearest caches page — IF you’re on an Android or iPhone device. If you’re using something else and want to try it on your phone, navigate to http://www.bcaching.com/m/Map.aspx. If it works for your device let me know and I’ll add the link for that device as well. The new map view is based on version 3 of the Google Maps API which now has support for mobile devices. Another minor update tonight. Full details here. Most interesting (in my opinion) is MUCH better support for touch screen devices. I’ve been able to test it on a Motorola Droid and Blackberry Storm, but I’d love to hear some feedback on how it looks on some other mobile browsers… like iPhone, Palm Pre, Windows Mobile and what about Nokia, and LG touch screen browsers? This topic is no longer up to date. The latest API documentation can be found here on the forums. 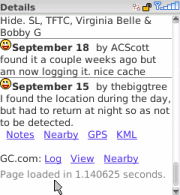 The bcaching API is intended for use by mobile geocaching apps to retrieve geocache data and have access to a large repository of geocache data without needing to store it all on the device itself. Response data for all requests except for “login” is in the standard GPX format. All query results are restricted to those that are accessible by the authenticated user. signature is an md5 hash of the querystring plus an md5 hash of the bcaching user’s password. Does nothing more than return success or failure based on the validation of the username password/hashword. Returns summary-only gpx data — with no short or long descriptions, extra waypoints, logs, etc. find is a URL-encoded string to search for caches by waypoint# (with or without the GC prefix) or partial name match. 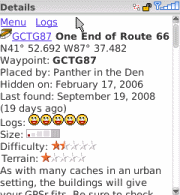 max-count is optional and specifies the maximum number of nearest caches to return in the gpx data. Default is 50.
cache-id-list is a comma-separated list of cache ids (not waypoint numbers). Cache ids are included in the summary gpx request. 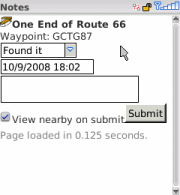 max-count is optional and specifies the maximum number of nearest caches to return in the gpx data. Default is 30.
all other parameters (desc, wpts, logs, tbs) are identical to Get cache detail section. First you must load the custom symbols onto your device (see below), then to use the custom symbols, go to the BCaching Desktop Map View, find the location you want to use as the center of the geocache data to load. Click [Send to Garmin Device] at the bottom of the page, then choose [Custom Waypoint Symbols] and follow the rest of the instructions on that page to finish. 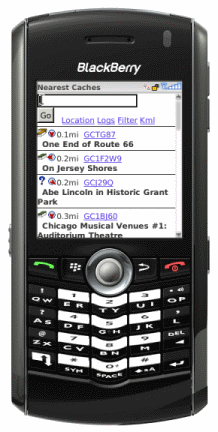 Note that using Custom symbols will limit the Geocaching “functionality” built into some Garmin devices since only one symbol can be designated as a “Geocache” that can be marked “Found”. If you want to retain that functionality for all geocache types then don’t use this feature. If you want to designate one of the custom symbols as a Geocache (such as the symbol for Traditional since they’re the most common), use the the Geocache Setup function on your device (on the 60CSx: Find => Geocache => Menu => Geocache Setup) and change the Find symbol. To load the custom symbols into your Garmin device, you must first download and install Garmin’s xImage utility (for Windows 2000 or later only). Then download the Custom Waypoint Symbols ZIP file and extract them to a temporary folder on your computer. Connect your Garmin device to your computer and turn it on. Run the xImage program and click [Next] on the Welcome page. On the Device Settings page, click [Find Device] to identity and select your device, then click [Next]. Click [Send images to the GPS] and click [Next]. Click [Select All] to highlight all Waypoint Symbols then click [Next]. Browse for and select the Custom Waypoint Symbols folder from where you extracted the ZIP file and click [OK]. xImage will then send the images to your device. Desktop Map now includes a Filter panel that allows filtering of geocache types, containers, terrain, difficulty and more. You can now download a summary GPX file (up to 999 waypoints) based on the current filter. The GPX file may be used in Google Earth or to send to your GPS device. The summary includes additional waypoints, but it does not include descriptions or logs. Enter the maximum number of waypoints (default is 500) and click the [Download GPX] button at the bottom of the Desktop Map page. You can also send cache data directly to your Garmin device using the Garmin Communicator web plug-in. 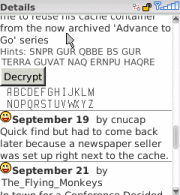 It also uses the current filter and sends the same information that would be sent in the GPX file. To begin, click the [Send to Garmin Device] button at the bottom of the Desktop Map page. If you encounter any issues, please post them on the forum. This wasn’t quite ready last week, but now you can also send waypoints to your Garmin using Custom Waypoint Symbols that represent cache type: traditional, multi, letterbox, mystery, etc. See the follow-up post for details.